Max Heating Output - 15 - 30.2 kW Gas Pressure - 0.4 - 1.5 bar Voltage - 230V Total Power Consump.. Heavy Duty Painted Finish Steel Fuel Tank Error Indicator Light Fuel Gauge Wheel Mounted Voltag..
Max Heating Output = 36Kw Air Output = 605 m/h Fuel Consumption = 3.04 Kg/h Power Supply = 220V ..
Max Heating Output = 46Kw Air Output = 1400 m/h Fuel Consumption = 3.88 Kg/h Power Supply = 220V .. Suitable for well Ventilated Indoor Applications. Very Economical Unit. 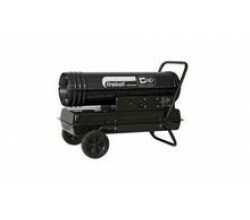 Voltage - 230V Tank Capac..
Btu = 100000/Hour Power Supply Voltage = 220 V Fuel = Diesel Tank = 30 Litre..